Over the past several years, the FDA and other groups have issued warnings about mercury and other harmful chemicals found in fish. This has led many people to stop eating fish. Even if you obey the FDA warnings in the strictest sense, the latest advisory says that up to 12 ounces of a variety of fish each week is safe for everyone. According to the American Heart Association, those looking to protect their hearts should eat a variety of types of fatty fish (such as salmon, tuna, and mackerel) at least twice a week. Those with heart disease should get 1 gram of omega-3s (containing both EPA and DHA) per day, preferably from fatty fish. But even if you don't like fish (or choose not to eat it), you can still get what you need from dietary sources such as flaxseed. “It's safe to say this (flaxseed) is the most potent plant source of omega-3," says Magee, author of The Flax Cookbook. While flaxseed contains no EPA or DHA, Magee says, it's a rich source of another omega-3 known as alpha-linolenic acid (ALA), which the body can use to make EPA and DHA. 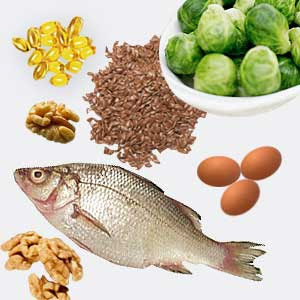 Other sources of omega-3s include broccoli, cantaloupe, kidney beans, spinach, grape leaves, Chinese cabbage, cauliflower, and walnuts. About an ounce -- or one handful -- of walnuts has about 2.5 grams of omega-3s which is equal to about 3.5 ounces of salmon.Factors found in olive oil can also help boost the good cholesterol, which can also help your heart.